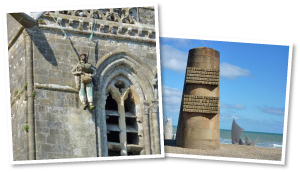 Rifleman Tours specialises in World War One and World War Two small group guided battlefield tours starting from just £249. Run by husband and wife team Tony and Allison Eden, Rifleman Tours is committed to providing a personal service at an extremely high level. Visiting the battlefields of World War One and World War Two is one of the most emotional and thought provoking experiences you can have. With the aid of our specialist guides and historians Rifleman Tours brings the battlefields back to life and conveys the thoughts and perspectives of all those who fought there, from the General to the humble Tommy. Our battlefield tours cater for small groups up to 22 people, and are specifically created to provide an informal, friendly relaxed atmosphere. They are suitable for everyone from the first time battlefield visitor to the history student and experienced researcher. In fact, our guests come from all walks of life and span all ages. Rifleman Tours offers executive coach/minibus travel from the UK with onboard refreshments and quality hotel accommodation in town centres with private facilities. Lunches are catered for during your battlefield tour on touring days and ALL museum entry fees are included. As well as a top class guide, a tour manager will be with your group at all times to take care of all your requirements. 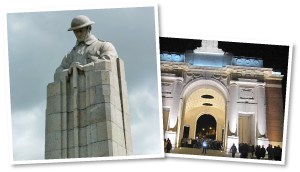 Rifleman Tours offers a number of scheduled battlefield tours that take place throughout the year visiting the battlefields of Ypres, the Somme and Normandy to name but a few. Each battlefield tour has a flexible itinerary which makes it easy to accommodate passengers wishing to visit a particular memorial or cemetery. 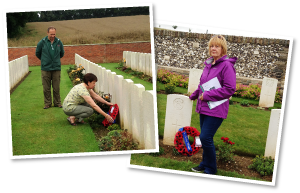 We also offer tailor-made battlefield tours for those who might wish to relate closely to the war experience of someone in their family. 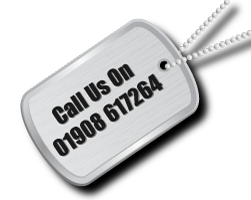 Rifleman Tours can help you to research any World War One or World War Two records that may exist about your relative, incorporating this information into your tour to allow you to walk in the footsteps of your ancestor. Groups and Associations are also catered for. If you are a Military Unit, Western Front or British Legion Branch, school or just a group of friends then we can arrange a battlefield tour or combined battlefield and cultural tour that can suit your group. We strive to offer a comprehensive battlefield tour at a competitive price. But don’t take our word for this, read our testimonials and let Rifleman Tours make your visit to the battlefields World War One and World War Two a truly memorable experience. Struggling to think of that special birthday gift? 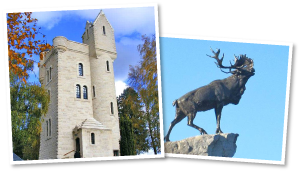 Let us help with a wide choice of 2, 3, 4 or 5 day WW1 and WW2 battlefield tours. We even have gift vouchers that can contribute to a battlefield tour. Click here for more details. We can arrange a personal visit to a particular cemetery or memorial to remember a family relative. Maybe someone you know has always wanted to witness, or take part in, The Last Post Ceremony at the Menin Gate in Ypres or are they partial to a Belgium beer because we offer a fantastic Beers and Battlefields of Flanders Tour. Have they watched the hit film Dunkirk and would like to see where it all happened or Saving Private Ryan and see the D-Day Normandy Landing Beaches. Click here for our great range of battlefield tours.